Blogging or microblogging on April 1st is a risky business. Chances are that someone is trying to pull your leg. 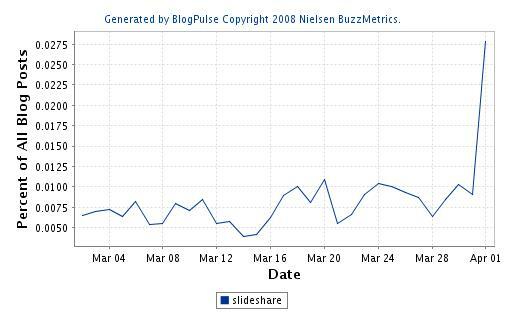 One of the more successful pranks today was done by the filesharing site SlideShare which sent an email to many users congratulating them on the sudden rise in traffic to the presentations they had uploaded to SlideShare. a LOT of views inthe last 24 hours. Bloggers and microbloggers were quick to communicate their sudden brush of fame to friends and followers, stating that one of their presentations had gotten thousands of views. Problem was that it was only an April fools joke. Below you can see the increase in mentions of SlideShare on blogs and on Twitter. Another successful joke today was published by the Guardian which claimed that the 188 year old newspaper would quit the paper edition and turn to publishing only on Twitter. This joke fooled Anna Serner, the CEO and Managing Director of the Swedish Newspaper Publishers’ Association, who blogged about the bold move by the Guardian. Tags: slideshare, micro blogs, bloggy, mikrobloggar, aprilskämt, twitter. Ping.